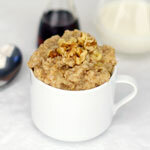 Bring oats and water to a boil in a sauce pan.Lower the heat and simmer until it is cooked to the desired thickness. When oatmeal is done mix in dried cranberries and almonds. Spoon into a bowl and top with a pinch of cinnamon. First of all, thanks very much to "Griffin" for this recipe submission. I made it this morning (6/11/11) and had just a couple suggestions. 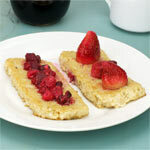 For just a bit more of a well-rounded flavor, I liked adding 1/2 teaspoon of sugar and just an 1/8 of teaspoon of vanilla. Stir those in when you add the cranberries and almonds. Another ingredient to consider adding is just the lightest amount of orange zest (no more than 1/8 teaspoon). 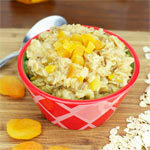 You'll be surprised how much flavor and freshness that adds to any oatmeal. Finally, a drizzle of fresh maple syrup is just the thing if you find you need a little more flavor or sweetness as you enjoy this dish. 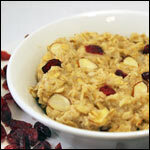 Cranberries lend a fruity tang and almonds offer a surprising light crunch in this healthy oatmeal breakfast. 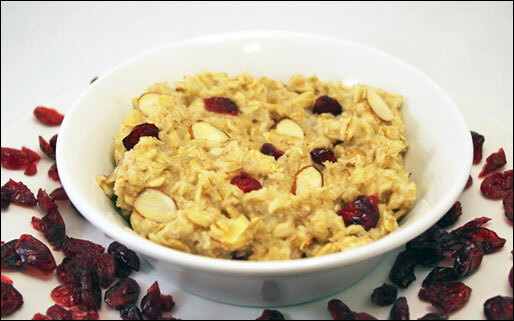 What do you think of Cranberry Almond Crunch Surprise Oatmeal? Needs a sprinkle of brown sugar at the end... with that it's very good. Without added sugar it's boring. I used almond slivers, not slices - you know, they look like little sticks. I liked that better because it has a little crunch. Also did half cranberries and raisins and sprinkled on brown sugar at the end. It was Ahhh... mazing! I used the suggestions from Mr. Breakfast below the recipe. Lovely!